The Centre for Christian Missions exists to bring glory to God through the fulfillment of the Great Commission of Christ through evangelism, social action ministries and disciple making. Bonnie Lou Ndelemeti, an American missionary, founded CCM in Ndola in 2000. It is currently based in Kitwe, Zambia. The College offers day school studies at the Kitwe Campus, correspondence studies through its Distance Learning Programme, and extension studies done either on or off campus. Over 280 students are currently being equipped for Christian living and ministry through CCM Bible College. Apart from having trained and experienced faculty, the college is accredited by the Association of Independent Christian Colleges and Seminaries (AICCS) in Missouri in the United States. The College library has over 10,000 resources for study and research, and a modern computer laboratory. Fiwale Hill Bible College is the official training institution for the Baptist Union of Zambia (BUZ). The college is located approximately 30 km from Ndola, on the road heading towards Lusaka. The primary goal of this college is to serve the church by providing quality education that enables ministers to communicate God’s word effectively in a rapidly changing world. Students of this college graduate with a Diploma in Biblical Studies and Theology (a three-year program). Unlike other colleges, the focus of Fiwale Bible College is not solely academic. Students are trained in life skills and character development, as well as godly farming skills to share with their communities. There is also a vibrant sports program for those who are talented in sports. The Justo Mwale University started as a theological college focusing on the training ministers in the Reformed Church in Zambia. This institution became a university college in 2008. The courses offered range from certificate to master’s courses, with the most popular being the Diploma in Theology and the Bachelor of Theology. To get more information about this college, contact the school directly via post – Plot 19 Munali Road, Chamba Valley, Lusaka Zambia, via phone on +260 975 819 348 or via email on info@justomwale.net. The Outreach Foundation, a major sponsor of this college, does not select individual students to receive scholarships. The decision is left to the college to decide whom to award the scholarships. Recipients may receive between $750 and $3,000 per year. The Trans-Africa Christian University (TACU) offers leadership training that is Christ-focused and Bible-based. The study programs are offered through Fulltime, and Open and Distance learning (ODL), and students can choose between certificate, diploma and degree programs. TACU is affiliated with the Pan-African Christian University (PACU) in Nairobi, Kenya, and is registered with the Ministry of Education in Zambia. The campus is located in Kitwe, Zambia. This University aims to deliver sustainable and empowered education to Christian leaders, in a mature Christian community setting. All student costs are subsidized, and as such, students are expected to pay their fees in full. Work sponsorship may, however, be available for students who meet the selection criteria. The Baptist Seminary of Zambia has taken up the mandate to train God-called and church-approved men and women of Zambia and other countries to be effective Christian servants. 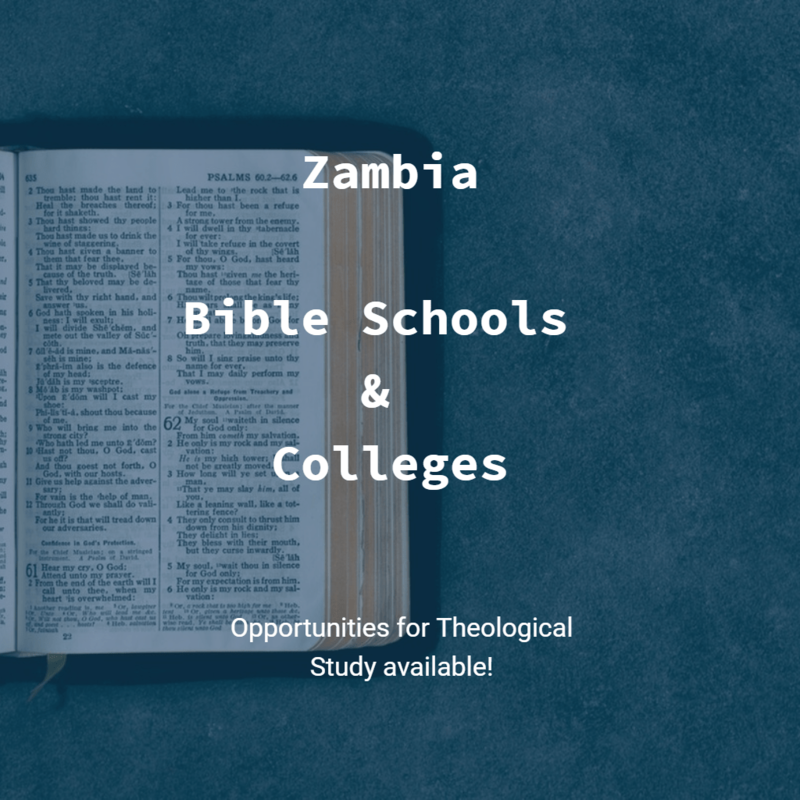 Located in Lusaka, Zambia, this seminary provides training that is multi-level and biblically based, with the aim of giving balance to knowledge acquisition, spiritual maturity and skill development. Students can choose whether they want to study for a Certificate, Advanced Certificate, Diploma or Bachelor of Theology. Scholarship aid is available for needy and deserving students. In August 2005, the River of Blessing Bible College in Lusaka became the first chartered school under the umbrella of the For His Glory Ministries and Bible College. For His Glory Ministries emphasizes on a three-fold focus in their teaching, i.e. worship, teaching God’s word and world missions. As such, students at River of Blessing do not just receive knowledge of the Bible and its truths, but they also get to experience the Word penetrating their hearts. Most of the students at this bible college are pastors and church leaders who would like to increase their knowledge of the Word of God so that they can serve their congregations better. Studies begin at the Diploma level and culminate at the Doctoral Level. Lusaka Bible College provides leadership training for individuals who are currently doing the work of pastors and evangelists. This college is located in Kanyama, an impoverished township that is home to about 300,000 people. Most of the students of this college come from this catchment area. The study program is tailor-made for people with church responsibilities. There is in-service training for pastors with no formal training, and evening classes for pastors. The primary goals of this bible college centre around the training, equipping and discipling of Christian leaders in and around Kanyama. There are a few study scholarships for students of this college, as most of the pastors and church leaders in the surrounding area cannot afford the tuition fee.